OPTPiX SpriteStudio | Web Technology Corp.
2018.10.17OPTPiX SpriteStudio Ver.6.2.2 has been released. 2018.09.12OPTPiX SpriteStudio Ver.6.2.1 has been released. 2018.07.24OPTPiX SpriteStudio Ver.6.2.0 for Windows has been released. 2018.05.16OPTPiX SpriteStudio Ver.6.1.3 has been released. 2018.05.16OPTPiX SpriteStudio Ver.5.8.3 for Mac has been released. From creating short animations to developing games. OPTPiX SpriteStudio substantially improves production efficiency by reducing complex work when producing sprite animation data. 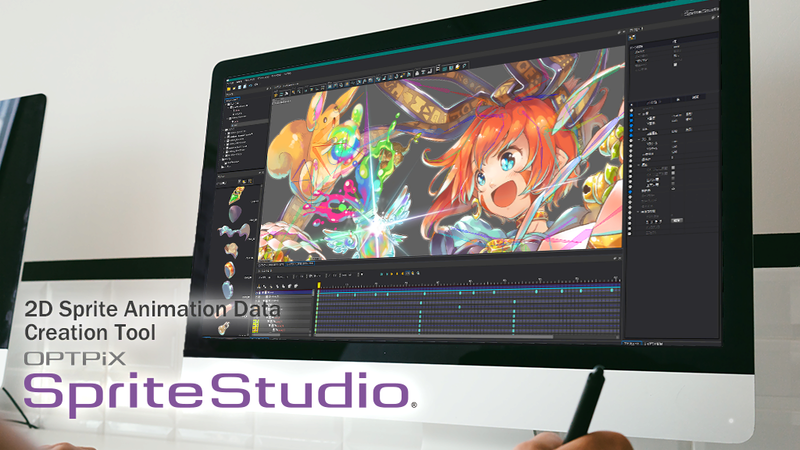 By using OPTPiX SpriteStudio, production of sprite animation data can be completed by the designer alone. In addition, the produced data can be used as desired as the data is "extremely versatile" data that can be used in various game scenes. Supported in Windows and Mac OS and is equipped with an English mode. The traditional method to create a hair fluttering effect was to "utilize detailed settings for vertex deformation of each part," but now we can enable a richer, more life-like expression by using the mesh and bone feature. This feature can be used with traditional animation creation methods, and more animations can be created more efficiently by using whichever method is most appropriate for moving a part. Also, a major feature is processing the range of influence (weight) of a bone by automatic calculations with simple settings. Comparison of animations using up to version 5.8 and animations using "bone and mesh"
Supports a "mask feature" to make a section where parts overlap each other permeable. Effects such as the "wipe" seen on television programming can be easily achieved. Since the masked section is also handled as a part, the position, size, and shape can be changed. Players for game engines used all over the world in smart phones and game consoles are available for free. Supports a wide variety of data formats such as Unity, Unreal Engine 4, and Cocos2d-x. The SDK is also available free of charge. Various players can be downloaded from the OPTPiX help center. * Players supporting version 6.0 will be released soon. Examples of games, smartphone applications, indie games, and educational organizations that use OPTPiX SpriteStudio are introduced. Subscription license for commercial and business use. A trial license is provided that allows all OPTPiX SpriteStudio features to be used free of charge for a limited time. The following cautions are for OPTPiX SpriteStudio version 5 series users who have migrated to version 6. Users that have a version 5 subscription can use version 6 without a new license agreement. See "Migrating version 5 data to version 6 data" in the OPTPiX help center for how to migrate data for version 5 to version 6. Operation is not guaranteed when the GPU display driver is not officially supported by the OS. Operation is not guaranteed if used in a virtual machine environment such as VMWare or Parallels. In addition to manuals and tutorial videos, various Players, SDKs, and sample data are publicly available. SDKs, linking tools such as TexturePacker and FLASH, tools to create project files from PSD files, and development version players (some) are also released on GitHub. We provide a Community Site to connect SpriteStudio users. Questions to be submitted to the development team and seminar information is here. Use the OPTPiX help center form to submit questions regarding the OPTPiX SpriteStudio, including questions before product purchases or questions during use. OPTPiX, SpriteStudio, Web Technology are registered trademarks of Web Technology Corp.
Copyright© Web Technology Corp. All rights reserved.